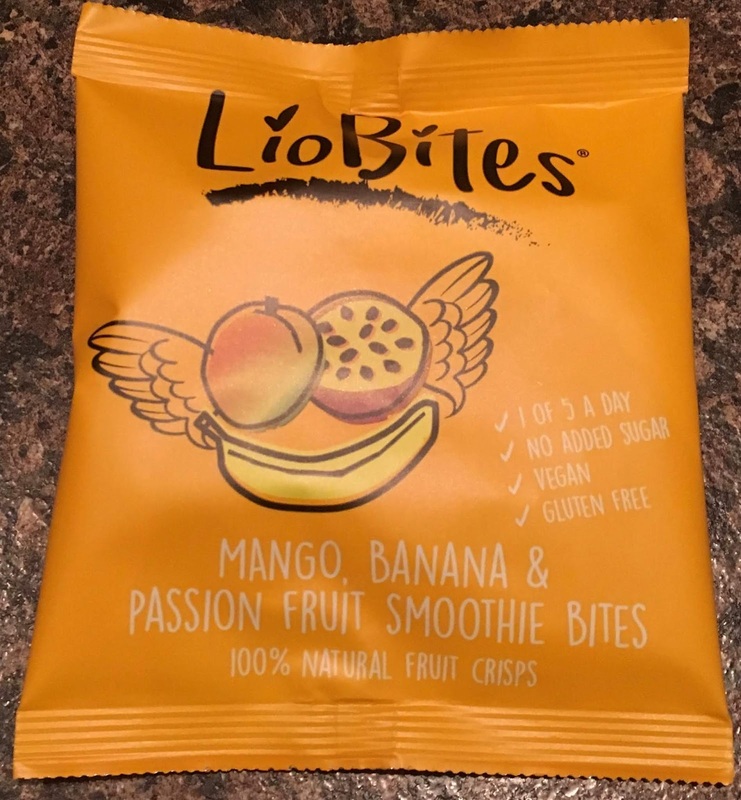 I recently had two packets of these LioBites Smoothie Bites in the post from Degustabox. It's always good to receive diverse snacks in the post, because often when we're barging through the scrummage of a local supermarket we can sometimes miss interesting products. These LioBites Smoothie Bites sound just the ticket to feed my obsession for finding alternative snacks to crisps and nuts. I don't have a problem with crisps at all, in fact I can't get enough of them, but for dietary reasons, I have to avoid nuts! This is of course a shame, as I miss the little fellas, but hey-ho! Now I might get a little mixed up here with different Smoothie Bites. 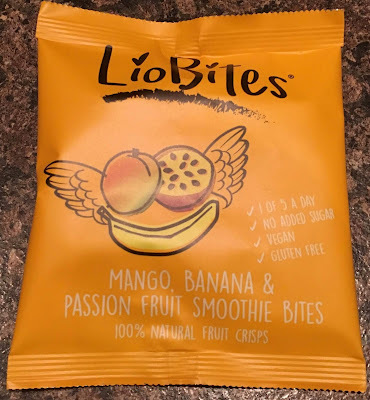 There are two packets you will see in the photographs; Mango, Banana & Passion Fruit Smoothie Bites; and also, Mango & Coconut Smoothie Bites. I'm sure you'll see why I'd rather mix up the packets, as there's the dreaded mango in both. I say 'dreaded mango', as I really don't like mango! 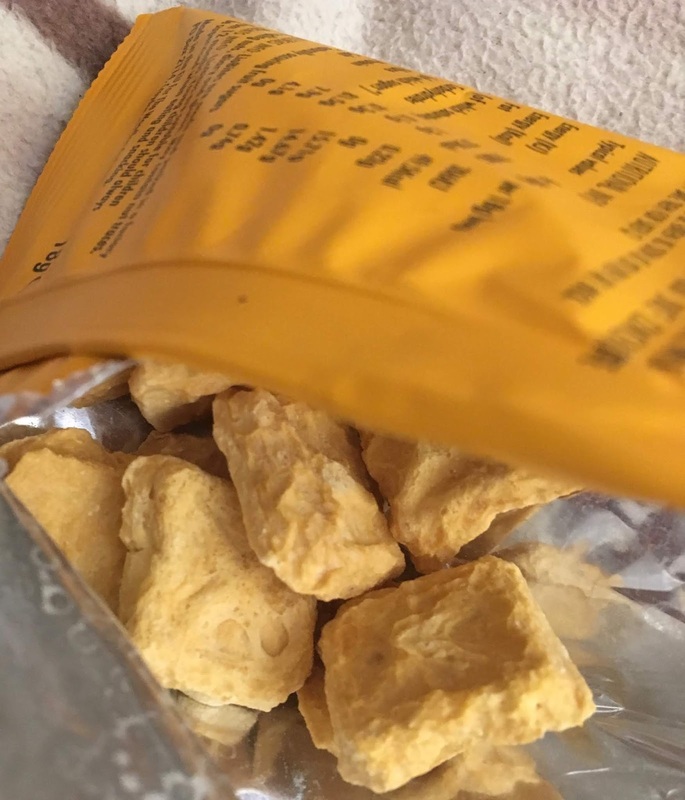 "Why are you trying a packet of mango crisps?" I hear you say; "Does Cinabar have a weird sense of humour?" A little… However, the thing about food and snacking is you never know in which form you may like it. Therefore I endeavour to persevere! An example of this is that I don't like cooked banana, such as Banoffee Pie (and definitely not banana beer…. Blaargh! ), but I do usually like banana crisps! 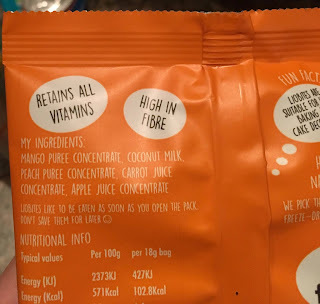 Having said that, I'm hoping that the coconut crisps are made from the inside of the coconut, rather than the outside! 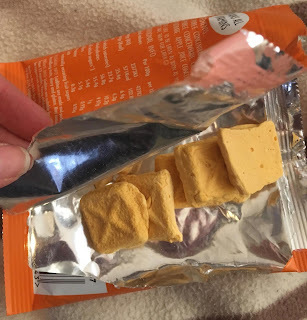 The big crosses didn't encourage me to eat them, however, I tried the Mango & Coconut Smoothie Bites first. They were very crunchy to start with and then melted in my mouth, but stuck to my teeth a bit. To me they just tasted of mango, but Cinabar said that they tasted of coconut. There's that weird sense of humour I was talking about. I tried the Mango, Banana & Passion Fruit Smoothie Bites next. They tasted of mango to start with, moving to banana and passionfruit into the aftertaste. Sucking on the sticky pieces in my teeth in desperation to get rid of them produced a banana, passion fruit mixed with mango type flavour, which wasn't wasn't all that pleasant after a while. There was even a bit of coconut flavour stuck to my teeth from trying the other crisps beforehand. 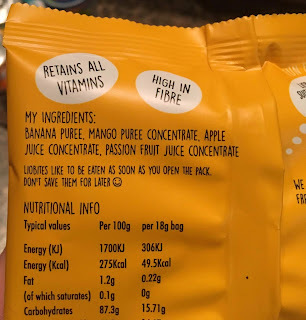 Mango, Banana & Passion Fruit Smoothie Bites; 49.5 calories, with 0.22g of fat, 14.67g of sugar, and 0g of salt. Ingredients included; banana puree, mango puree concentrate, apply juice concentrate, passion fruit juice concentrate. 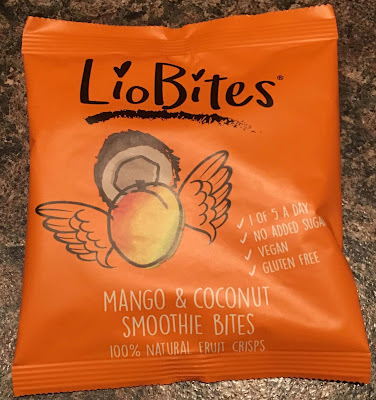 Mango, and Coconut Smoothie Bites; 102.8 calories, with 6.4g of fat, 9.97g of sugar, and 0.05g of salt. Ingredients included; mango puree concentrate, coconut milk, apply juice concentrate, peach puree concentrate, carrot juice concentrate.